Hello new friend! This blog has a new domain. Click here to go to the NEW JOYPEDROW.COM and click here to read the post: God’s Love Letter to You. 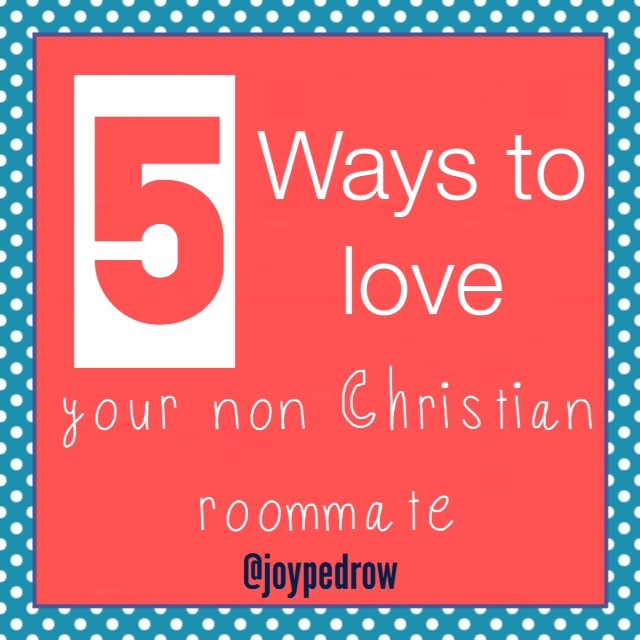 When paired with a random roommate in college, learning to live together can be challenging. It can be even more challenging if you both have different beliefs and lifestyles. If this happens and she is not a follower of Christ, here are 5 ways to help show her the love of Jesus in a kind, non-threatening way. Include. Invite her into your group of friends. If you’re planning a dinner out, ask if she wants to come. If you’re going to a game night, invite her! Invite her to church, college ministry events and meetings, and even just to hang out on campus! When she feels included and begins to make friends with other believers, the more she will get to experience Jesus’ love. Help. Go out of your way to do her chores, vacuum her side of the room, clean the bathroom, or take out the trash. Most people are not fans of chores, so she’ll probably be surprised and thankful for the help. She may even ask why you’re helping her. Perfect opportunity to share the gospel. Pray. Be intentional about praying for her. Pray that she would come to know Jesus. Pray that Jesus’ love would shine through you. You can even ask her if there is anything she needs prayer for. This shows you really do care. Listen. In college not everyone has someone close by to listen to their problems, especially freshman. When she seems upset, ask her what is wrong and then take the time to listen. Don’t feel the need to spill out Bible verses, just sit and listen. If she asks you for help, then offer loving advice. Be authentic. Be yourself. Don’t change who you are out of fear that she won’t like you. For example, do not avoid reading your Bible because you think she might find it weird. Maybe she will see you reading it and ask you why. Being authentic with her can create many opportunities to share the gospel! Remember that Jesus loves her just as much as you. She is also the daughter of a King, she just may not know that yet. You two were paired up for a reason, and maybe that reason is so she can come to know Jesus. This blog has a new domain. Click here to go to the NEW JOYPEDROW.COM and click here to read the post: God’s Love Letter to You. For other Dear Friend Series posts click here!